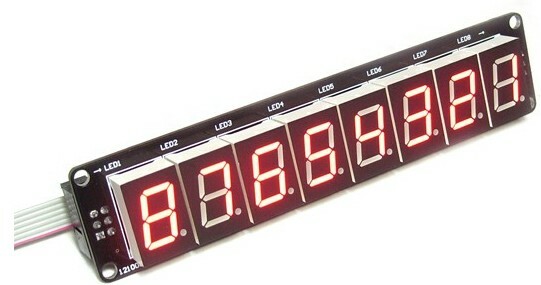 This is 8 digital bits serial LED display. It features a flick free display and 3-Wire interface which allows more than 2 modules can be serial linked. With Interface Shield For Arduino (SKU: DFR0074), this module can be plug and play. This module is linked to interface shield via IDC6 cables. 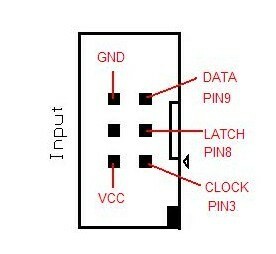 Make sure that the first input is plugged onto "Input" socket of the module. The "Output" socket is linked to the second module "Input socket". // represented by the values 48 through 57. Additional sample code with the capability to print letters. Open serial monitor, and type "12345678". The LED module should display "87654321"
The Arrays Tab and Taf contain numbers and letters encoded as HEX which tells the LED Module which segments to light. For example the first element of Tab =0xC0 which is the number 0. The zeros and ones represent the light(0's) segments and the off(1's) segments from the 7 segment display. Get 3-Wire LED Module from DFRobot Store or DFRobot Distributor.